There are a few things that everyone, regardless of creed, thinks to be evil, and near the top of this short list is PowerPoint. So it is no surprise that, when Lucifer Morningstar—otherwise known as Satan—appears in struggling writer Billy Ridgeway’s living room, the Devil’s proposition is presented in slideshow format. 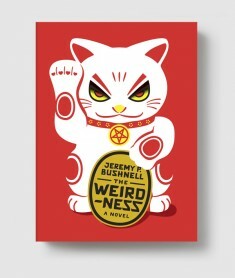 In Jeremy P. Bushnell’s debut novel, “The Weirdness,” not even the Devil is exempt from the trashiness of modern living—and its concomitant humor and angst. Billy Ridgeway—New Yorker, college dropout, and sandwich-shop employee—has a life that is falling apart. His handful of published short stories have failed to vault him from the obscurity of the sandwich shop’s kitchen, and his art-film director girlfriend, Denver, may have broken up with him; in an all-too-typical twist of modern relationships, he has not heard from her for several days and their status is unclear. As a result, the appearance of the Devil is in some ways a pick-me-up for Billy, although the contents of his PowerPoint presentation are disturbing: a centuries-old warlock in Manhattan, Timothy Ollard, has stolen from Hell a dangerous magical machine that threatens to engulf the universe in fire. The Devil, who would prefer to keep the world around so that there are more souls for him to ensnare, has as a result come to Billy with the seemingly impossible task of capturing the item. One might make the criticism that “The Weirdness” never transcends low burlesque. The themes of eternal punishment, the destruction of the world, and moral agency are not engaged with any seriousness or philosophical sophistication. This, however, is a matter of taste. Bushnell seeks to amuse, not to probe the wounds of human existence, and he does so with great efficacy. There is no point to Satan’s drug use or love of PowerPoint besides humor—and why should there be? There is no reason that humor is not just as worthy an inherent aesthetic end as thematic depth. Life is as funny as it is sad. Literature should be, too. Ultimately, “The Weirdness” is a novel that succeeds within its parameters, and it succeeds brilliantly. Bushnell has not written a work of great profundity, but he has fulfilled the greatest and perhaps most commonly neglected task of the fiction writer: he has written a work that is immensely entertaining, and more than being merely diverting, is truly funny. Sam Chalsen reflects on writing his screenwriting thesis and shares a scene from his screenplay.